Home / Savings Blog Posts / How to Save Money / Do It Yourself / Homemade Dog Treats Recipe! Do you have a furry loved one at home?! If so, this Homemade Dog Treats Recipe is for you! Try this Homemade Dog Treats Recipe if you are trying to save in your budget or if you are just wanting to watch the food ingredients for your dogs. These sweet potato apple homemade dog treats are so easy to make and perfect for your fuzzy companion. My kids absolutely adore their dog and we love making dog treats for our K9 companion. 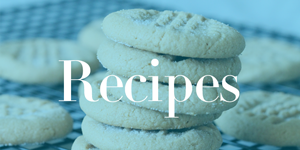 I enjoy making treats for him because it’s something the kids and I can do together in the kitchen and I know exactly what ingredients are going into the treats I make for my dog. I know, I know, he’s only a dog, but he’s also a family member and I care about him and his health! Sweet potatoes and apples are some of my favorite foods so it makes sense my dog loves them, too! When the kids and I make these dog treats, I roll them into balls and they “squish” them and place them onto the baking sheet. This causes for lots of laughs and giggles and funny sounds of squishing the dough. We always have fun making these. If you don’t want to roll your treats into balls and squish them, you can always flatten them into a pan (use your fingers) and cut them with a pizza cutter or sharp knife before baking them. And depending on the thickness of your dough, you may have to put them in for a shorter or longer baking time. Check after 20 minutes to make sure they aren’t burning. I’m certain your pooch will love these homemade dog treats as much as I do! These sweet potato apple homemade dog treats are perfect for your fuzzy companion. In a large bowl, add sweet potato, apple, whole wheat flour, corn meal and olive oil. Mix well. Dough will be a little bit stiff and you can add more olive oil (1-2 Tablespoons) as necessary. Roll into tablespoon size balls and flatten with the palm of your hand until double in size. Place onto a baking sheet and bake for 20-35 minutes or until golden brown and crispy. Cool completely before giving to your dog. Store in an airtight container. Alternatively you can flatten the dough on a baking sheet and cut with a pizza cutter or sharp knife into squares. Bake as directed. This is such a fun activity for the kids to do with you to get involved in the pet care process! If you love making these DIY Dog Treats, here are even more DIY Recipes you will want to check out that can save you money!